From the Montblanc's Patron of the Arts series of releases, Ludwig II is the latest pens and ink released. Named after, unsurprisingly, Ludwig II of Bavaria. Ludwig II is also known as the Swan King because he spent much of his youth in Hohenschwangau (“high region of the swan”) which had its own Schwansee (Swan Lake) which may have inspired Tchaikovsky's Swan Lake ballet. Another ink released at the same time is Petit Prince Red Fox, based on the fox from Saint-Exupéry's The Little Prince. You kind find that review here. 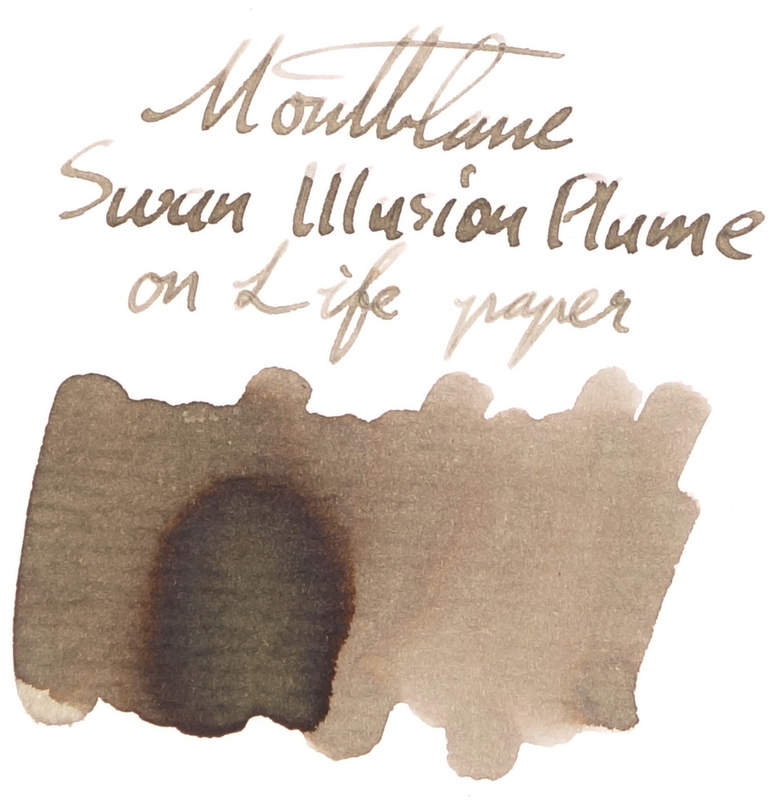 Montblanc Swan Illusion Plume is described by a sticker on the base of the bottle as "taupe" and I think this is a perfect description of they brown-leaning grey ink. This colour can change a bit depending on the paper but in general it's a nice soft grey that has a very noticeable neutral orange-brown tint to it. This is a pretty unsaturated ink, but as it's a grey it works well with less saturation. 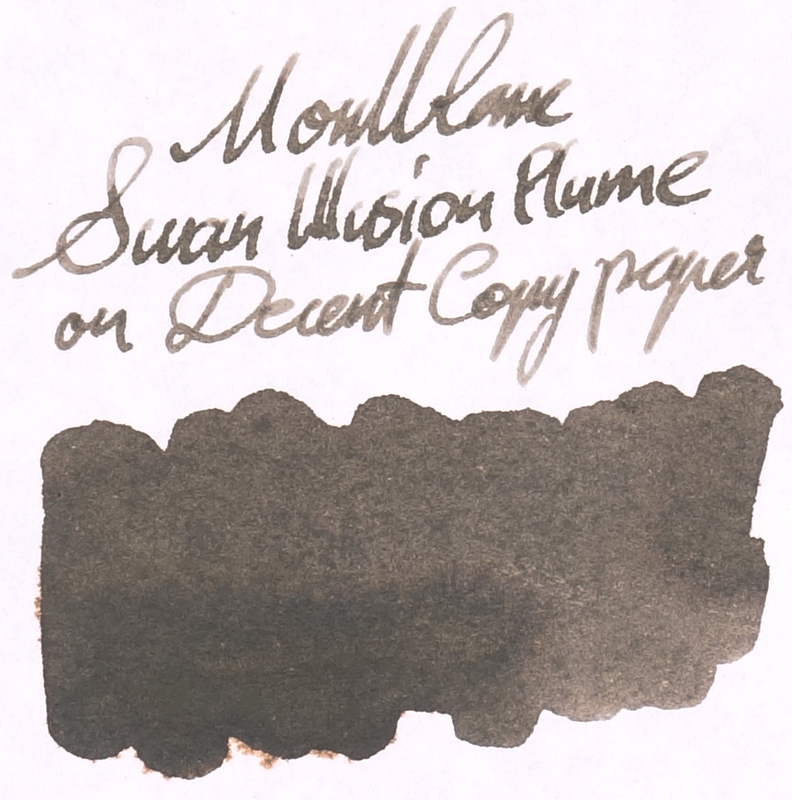 The ink runs moderately wet and is an improvement over previously released Montblanc inks. 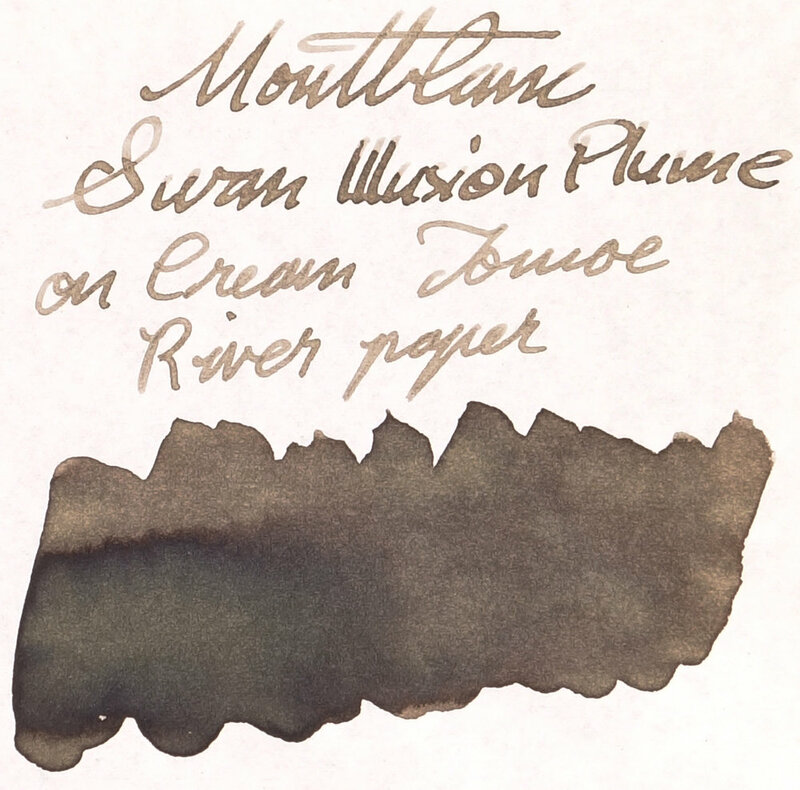 Not unusually for Montblanc inks, Swan Illusion Plume takes a extra hit on it's saturation on it's saturation on Tomoe River. paper. There is absolutely no sheen on this ink in any paper no matter how much ink has been out on the page. This ink has some very contrasting shading and that's where it shines. There might not be a lot of shading on each line (though there's a very decent amount) but the shading from dark to light is quite abrupt and looks quite nice. The ink doesn't perform the best on very poor paper. With some copy paper I have it almost turns into a piece of chromatography with the orange bleeding out of the swatch. The colour difference as well between on copy paper (where it's almost a proper neutrally coloured grey), compared to on Midori paper where not only is it much browner with a slight green hint but it also shades a coppery brown. Paper makes quite a difference on this ink. 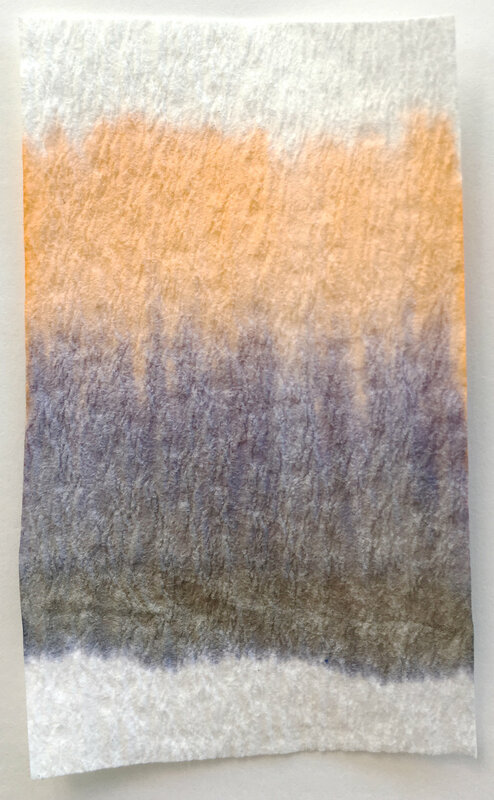 Chromatography is relatively interesting with a dark grey over where the line was drawn that moves to a blue-purple grey and finally a pale orange. Dry time on Rhodia is pretty average and on Tomoe River it's on the slow side of average but still in the middle. The ink is decently saturated on Rhodia for a grey and the shading is pretty nice. There's no smearing at all but what's interesting is how water resistant this is. When dabbed quickly after a drop has been put on the ink (left test) there's barely any change and even when the drop is left there for a while (right test) the brown disappears but some neutral grey lines underneath remain. Rohrer & Klingner Sepia is surprisingly similar; it's too dark and a little too red but not too different. Kobe #31 Kaigan Stone Grey is much darker and the subtle brown tint to it is too red. Kirshna Pencil isn't too dark but is more mauve leaning than brown. Montblanc Einstein has a hint of brown to it but is mostly a very neutral grey and is also too dark. Kyo-Iro Stone Road of Gion isn't too dark but is a little too yellow and slightly oversaturated. 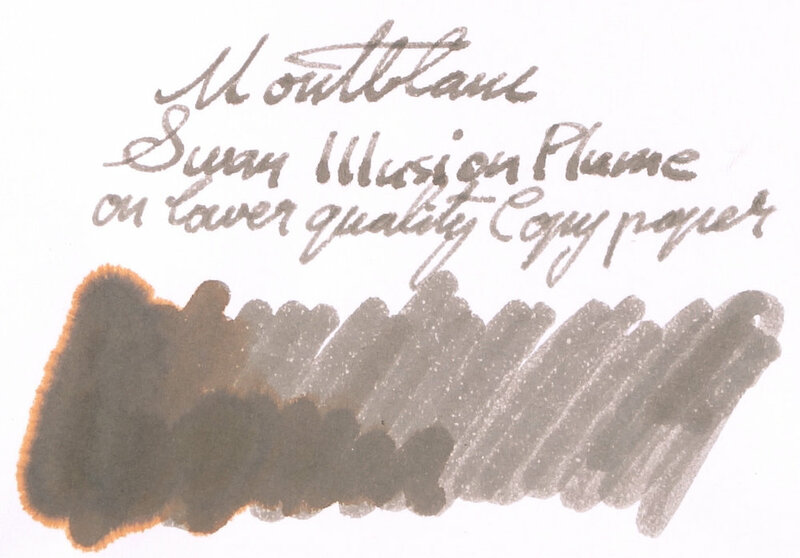 Montblanc Oyster Grey is very neutral that's a fairly similar brightness. Graf von Faber-Castell Stone Grey is also nice and neutral but too dark. The outlier is, supposedly, Organics Studio Edgar Allan Poe. Now, this is obviously different from the way Edgar Allen Poe is meant to look which is a nice Burgundy. This was a sample from a shop that had been sent afflicted bottles of Edgar Allen Poe (I grabbed this sample knowing it was different). I've heard, infrequently, reports of the colours of Organics Studio inks being a little volatile in terms of colour and not in the batch variation way that Noodler's has but that there are some bottles that tare just wrong. This is definitely one of them and, coincidentally, is also very similar in every way to Montblanc Swan Illusion Plume. It is by far the closest looking ink; similar hue, similar brightness, similar saturation. Apart from The Edgar Allan Poe which really is an unfair comparison, Rohrer & Klingner Sepia and Kyo-Iro Road of Gion are the closest. The brightness is a little higher on Tomoe River and the saturation is lower. 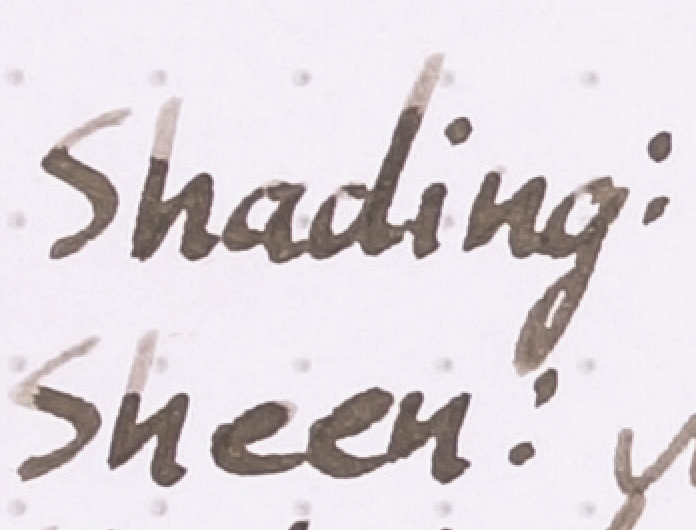 Shading isn't bad but isn't as high or contrasting as on Rhodia. There is a lovely strong halo here, however, and no smear which is always good and sometimes a risk on Tomoe River paper. Water Resistance is similarly pretty good. 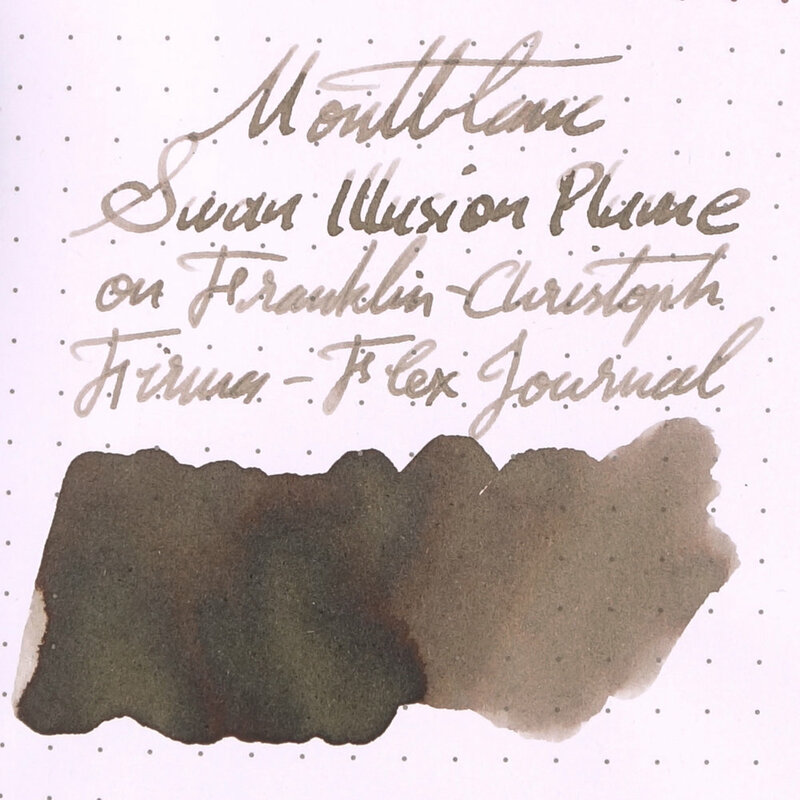 While Montblanc Swan Illusion Plume has lightened and lost some saturation, Rohrer & Klingner Sepia hasn't so it's now quite a bit darker. Kobe #31 Kaigan Stone Grey is a touch lighter now but is still too dark and leans too red. Krishna Pencil's mauve colour is a little stronger now. Montblanc Einstein is now not too bad. It's brown tint is much subtler than Swan Illusion and it is still a little darker but the differences aren't huge. Kyo-Iro Stone Road of Gion is similar to on Rhoida in that it's similar but too yellow. Montblanc Oyster Grey is far too neutral but this time slightly too light. Graf von Faber-Castell is the same but a little too dark, though not as much as when on Rhodia. The afflicted Organics Studio Edgar Allan Poe is still a very similar ink in every way. Noodler's Lexington Grey is way too dark and while it does lean brown it also, ever so slightly, has a green tint to it. I quite like this ink. I don't think this an ink for everyone and I certainly don't see this as a hype ink but, especially as a collector, I love how unique this ink is. This ink feels lovely and soft and I think that it would be great for letter writing but I don't see it as a great note taking ink and certainly not a work related ink. I don't think many will hate this but I reckon there will be a fair few that are unimpressed, conversely I think there will be some that like it but I don't believe this will be many peoples' favourite ink. I imagine there will be some apathy towards it as well and at €35,60, AU$50, and US$43, apathy would usually translate to not buying. Still, I like this ink; I find it to be nice and unique, it writes well, and it's a beautifully soft colour.